"I got the job!" "Happy Birthday!" "Congratulations!" There's always something to celebrate! Sometimes it's something small like a successful meeting, a new client, or maybe cheering someone up, but sometimes it's something big like a new job or a friend's engagement, or (my favorite!) a birthday! 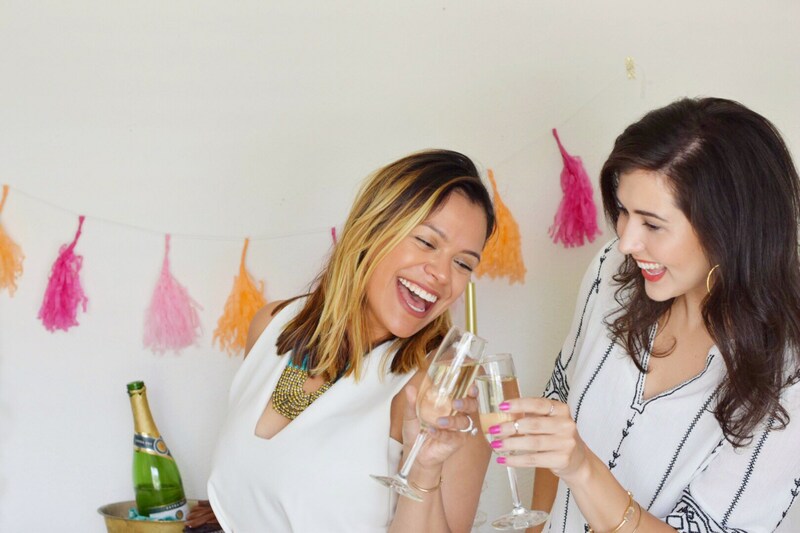 Even when we have big news to celebrate, life doesn't always slow down long enough to take a celebratory vacation or plan a party, so today I'm sharing tips on SMALL ways to celebrate BIG! I was catching up with my friend and fellow blogger, Melissa, at Dallas Blogger Brunch and she was so excited to share that her husband had accepted a new job! After talking, I knew we could create a simple celebration and show you how easy it is to make someone feel loved and celebrated. Use what you have. I rarely have to purchase party supplies anymore because I have amassed quite a collection of tassels, streamers, and confetti over the years. Now I have a designated party supply storage area and I can easily create a festive atmosphere using items I already own. 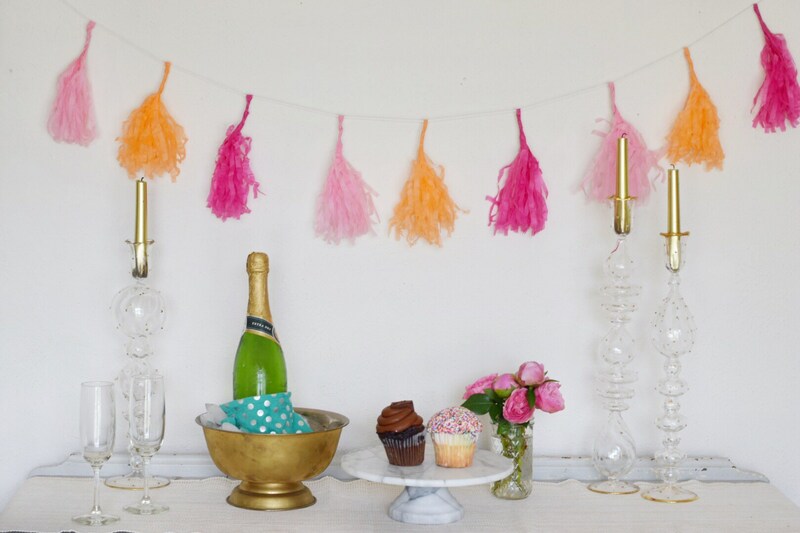 If you need to build your party supply wardrobe, these pink & orange tassels from Target are my favorite. Keep it simple. Don't try to decorate the entire house! One small decorated area makes a large impact! Stick to one or two colors to keep things looking cohesive without a lot of effort. 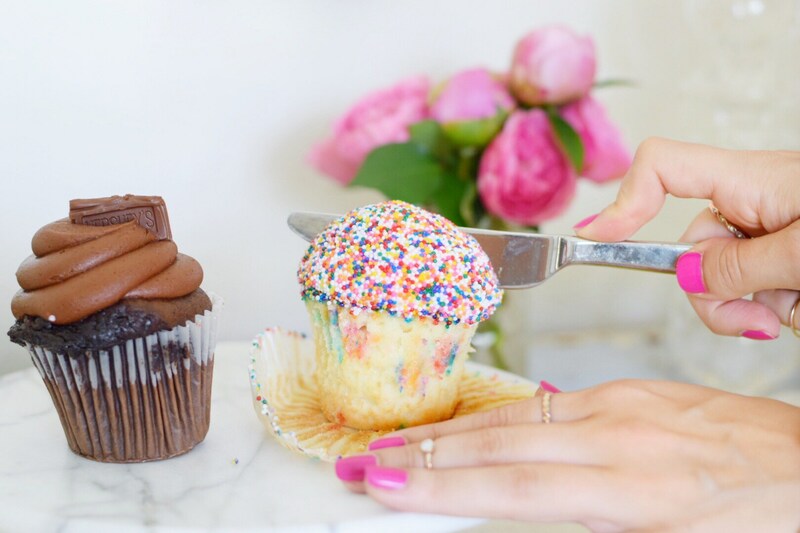 In this case, I tied in the pink from my tassels to the pink flowers and the pink sprinkles in one of the cupcakes. Simple, but it looks like I put a lot of thought into the setup. Create an intimate environment. When you celebrate, it's tempting to pull out all the stops, throw balloons and confetti everywhere, order a giant cake, and invite 100 people to your house. (Is that just me??) 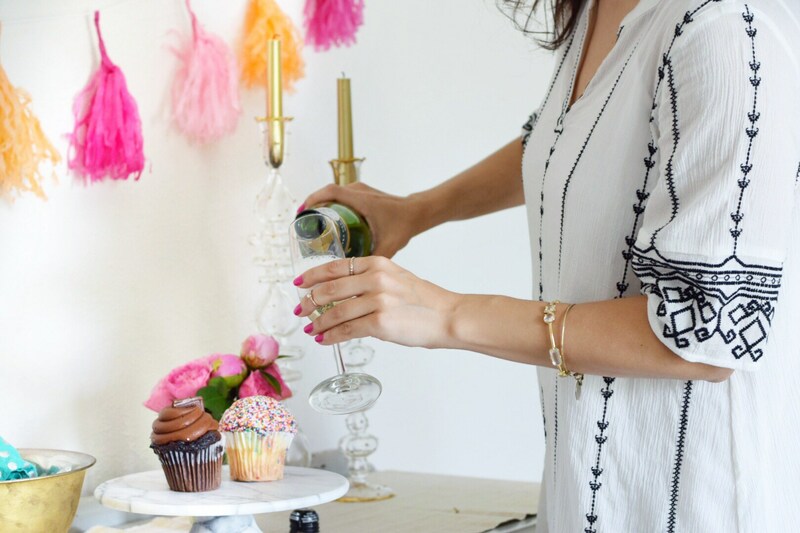 Those parties are fun, but it's also special to set out two special plates, two glasses, and two cupcakes to create an intimate celebration at home. I love the idea of surprising your significant other or a friend with a sweet celebration setup in your house. Know their favorites. What kind of cake does he like? What's her favorite flower? 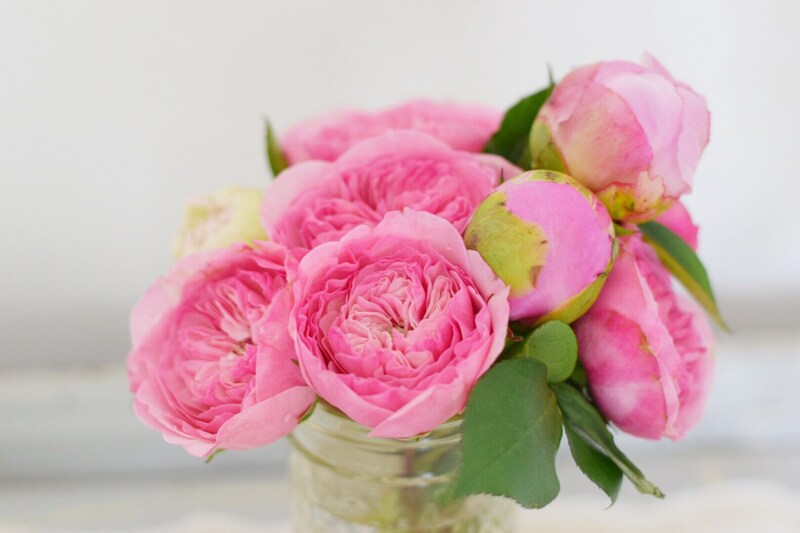 If you know me, you know that my favorite flower is a peony, my favorite color is pink, and I can crush a red velvet cupcake in about 2.5 seconds! Knowing those few tidbits of information about close friends and significant others can make sweet surprises much simpler. *Pro tip: keep a running note on your phone with those helpful tidbits of information if you can't seem to remember them! It's a small touch, but can make someone feel that much more known and loved. Have a go-to. 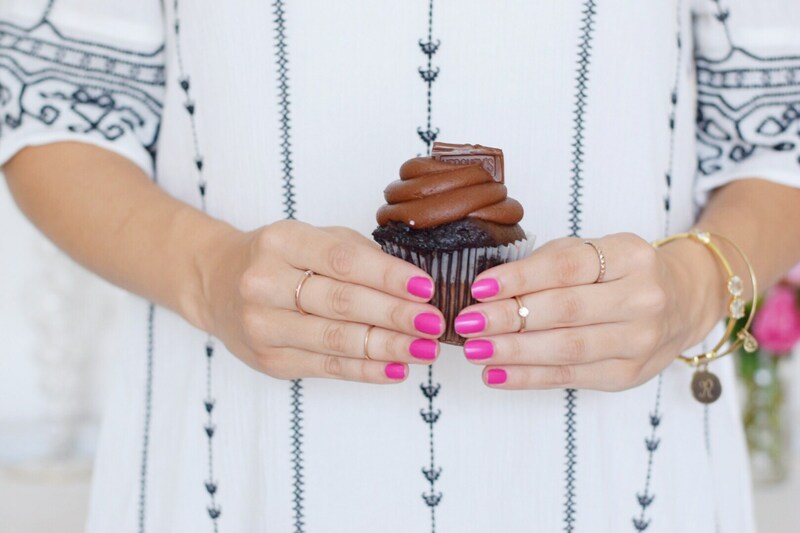 Pressed for time and you've never been to a bakery and have no idea where to start? Don't stress! If it's after normal business hours, a high-end grocery store is a great backup option for a sweet treat. I recommend finding a local bakery that accepts call-in orders for faster pickup after work or on busy days! I have a few favorites in Dallas that I frequent for birthdays, surprises, and those days when I just need a treat. These cupcakes are from Trailercakes, and I have to be honest and say that my favorite part of this post was getting to eat the props! Trailercakes is in my rotation of favorites in Dallas because they sell two sizes of cupcakes: minis and biggies (so cute). 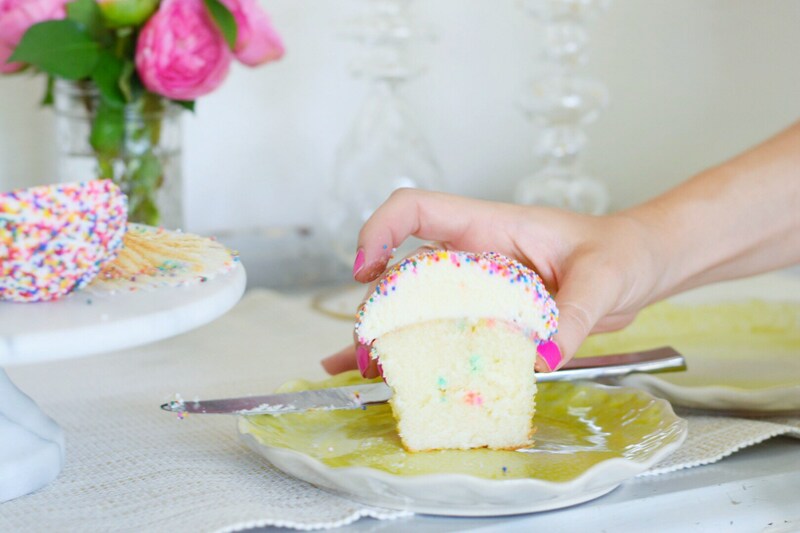 This sprinkled beauty is the "Happy Days" flavor and is hard to beat! Don't stress. Knowing that someone took time out of their day to think about you is a great feeling. 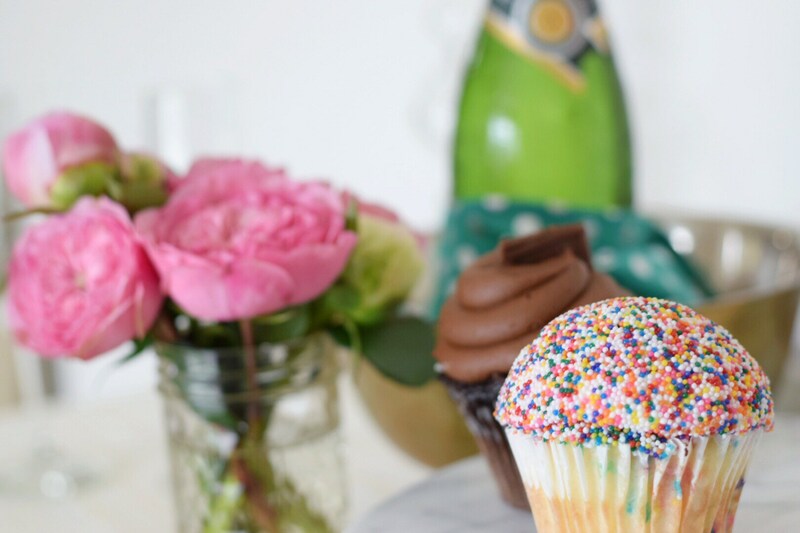 Remember that it's the thought that counts and that even if your setup isn't perfect or you forget their favorite cupcake flavor, your thoughtfulness won't go unnoticed! Cheers! Thank you to Melissa and Trailercakes for contributing to this post!